Quite some time ago, Sony released several full-frame mirrorless camera models: Sony a7, Sony a7R, and Sony a7S. And, quite recently, the company has updated the line-up with newer, upgraded models: Sony a7 II, Sony a7R II, and Sony a7S II. Therefore, you may be a little bit confused in choosing for the right Sony full-frame mirrorless camera model. What are the differences between Sony a7 II, Sony a7R II, and Sony a7S II? What improvements do they bring in regards to the older models? Which is the one that you should get? Don’t worry, my friend, because we will discuss all the three Sony full-frame mirrorless camera variants here! What is a full-frame mirrorless camera? A full-frame mirrorless camera is a mirrorless camera that uses a sensor with a size equivalent to 35mm films, which is, 24mm x 36mm. Among the sensor sizes available for mirrorless cameras, full-frame is the largest. Sensors larger than full-frame can only be found by moving up to truly professional gears like medium-format cameras. Initially, full-frame sensors are typically found in DSLRs, while mirrorless cameras tended to rely on the smaller APS-C and Micro Four Thirds sensors – the cropped-frame sensors. However, manufacturers like Sony and Leica have quite recently introduced high-class mirrorless camera models that feature full-frame sensors. Compared to other sensors, full-frame sensors are typically bulky, heavy, and, of course, pricey. So, why do you need a full-frame camera? Because a larger sensor can indeed produce significantly better images. Having a larger sensor means having more surface area that can capture the light coming to your camera. As the effect, the color depth and dynamic range can be hugely improved. This effect is particularly more noticeable when handling high megapixel counts. Photos can be warmer, more natural, and more realistic. In addition, many people love full-frame mirrorless cameras because they are able to preserve the native focal lengths and are compatible with older 35mm lenses from the era of shooting with films. 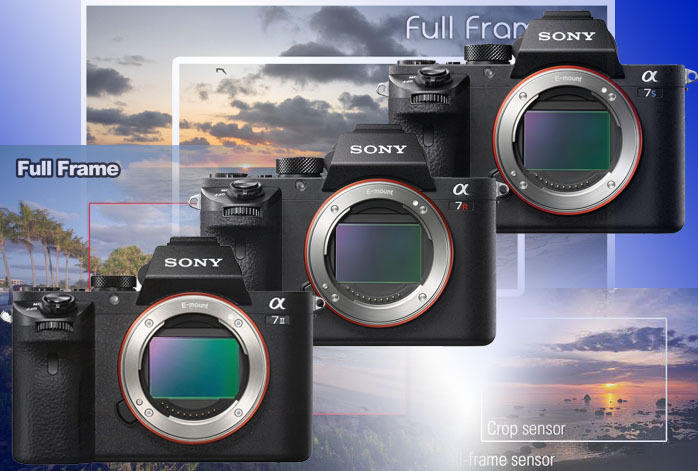 Some time ago, Sony updated their full-frame mirrorless camera line-up with Sony a7 II, Sony a7R II, and Sony a7S II. So, if you are into mirrorless cameras and would like to upgrade to a full-frame one, which is the model that you should choose? Below, you can find the review for every specific model, along with the recommendation about what they are best for. – They have more-or-less identical overall dimensions. They are designed very identically to each other; the sole exception goes only for the written names. – Each of them comes with a similar layout of 9 customizable buttons and 45 assignable functions. – Each of them has a multi-interface external shoe. – They each has a 1200-zone evaluative light metering. – They each features a 1.3cm (0.5-inch) electronic viewfinder. – Each is equipped with a tiltable 7.5cm (3-inch) TruBlack XtraFine LCD screen. – All of them are powered by Exmor CMOS full-frame sensors that differ only in the megapixels count. – They all have built-in WiFi and NFC. – Sony a7 II, Sony a7R II, and Sony a7S II all have 5 fps maximum continuous shooting speed and 1/250s maximum flash sync speed. Sony a7 II is designed as the balanced model, with decent resolution and ISO range. This is noticeable by the megapixel count, which stands in between the other two models. Sony a7 II is armed with a 24.3MP full-frame CMOS sensor. Furthermore, it has an anti-aliasing filter that can effectively reduce moire. It has an excellent RAW dynamic range and solid colors, especially at low sensitivity levels. However, it can get a bit too noisy at high ISOs. Best for: Users who need versatility and users who handle various types of photography, but find Sony a7R II to be too expensive. Check the best price for Sony a7 II here! Sony a7R II is actually designed for an ultra-high resolution, but we may find it as a great upgrade from Sony a7 II as well. It features the world’s first full-frame back-illuminated Exmor R CMOS sensor, which is 42.4MP. With such power, it can effortlessly capture large-sized images with extreme levels of details, sharpness, and accuracy. Not only it delivers phenomenal resolutions, but also it boasts excellent noise performance and dynamic range. You can shoot stills and videos of high-contrast scenes with true finesse. Also, it records 4K video with full pixel readout and no pixel binning. Compared to Sony a7 II, the number of AF points is higher (25 contrast-detection points and 399 phase-detection points) and the maximum expanded ISO range is wider (50 – 102,400). It also features the five-axis image stabilization system, but lacks the anti-aliasing filter. Best for: Photography genres that greatly benefit from higher megapixel counts, such as landscape, architecture, fashion/studio, and product/macro. Also an excellent step up from Sony a7 II. Check the best price for Sony a7R II here! Now, this model is a little bit different from the others. Sony a7S II is armed with a 12.2MP full-frame Exmor CMOS sensor and BIONZ X image processing engine. The megapixel count is the lowest one here, so it may not be the best choice for making large-sized images. However, despite the low resolution, Sony a7S II is actually able to deliver impressive image quality. The colors are full and solid, with an excellent dynamic range. It also features a similar five-axis image stabilization system and a Hybrid AF system that features 169 contrast detection points. However, the primary reason of why Sony a7S II is so popular is its amazing sensitivity range. Yes, Sony a7S II is often referred as the low-light legend. It boasts a maximum ISO range of 50 – 409,600! It is simply amazing, as it can still capture recognizable images in near-total darkness. With such vast sensitivity levels, you can be a lot more creative in many ways. Another strength of Sony a7S II is its video performance – it can record 4K videos using an external recorder, and 1080p videos with virtually no moire. Best for: Video recording, low-light and night photography.